To this day, I love making large batches of homemade stock. Often, the perfume of a simmering mirepoix is more tantalizing than that of meatballs and tomato sauce (another Mrs. Nigro claim to fame). Typically, I reserve the homemade stuff for occasions where it’s really the star — basically, soups — a good, boxed (or canned) variety is still my go-to for risotto, especially during the summer. 1st: Do not boil the stock. Yes, it’s brought to a vigorous simmer at first, but then promptly lowered to barely a simmer for the duration. 2nd: Occasionally skim off the white, foamy layer from the top of the stock. If you have to do this more than three times, the stock is probably simmering too vigorously. 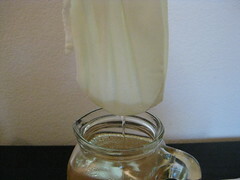 3rd: When straining (each time, not just the first strain), do not press down on the solids. It’s tempting, but better to let them drain naturally with the occasional shake to move things around a bit. 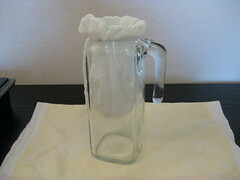 4th: Don’t skip the second straining through cheesecloth or a jelly straining bag. No one likes to chop down on a tiny piece of chicken bone, this helps everyone avoid that off-putting possibility. I really love the jelly bags because they can be used over and over for a variety of straining tasks. To get them really clean and eliminate any food odors, I wash them by hand right away with dish soap, then (despite what the instructions on the pack say) throw them in the washing machine with a load of whites. 5th: Clarify it. This is an optional step, but truly is the icing on the cake. As the egg white cooks, it traps any teeny particles that remain in the stock, essentially acting as your last, most impossibly fine filter. If you’re dubious that it will actually work, clarify only half of the stock to start (that’s what I often do anyway, just for insurance in case I am not paying enough attention and something goes wrong — hasn’t happened yet [knock on wood]). I included photos below of how the mixture looks over time so you have a better idea of what’s normal. 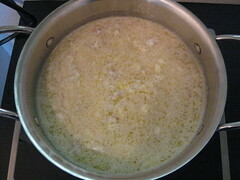 In a large stock pot (I used a 16 quart, but 12 should work), heat olive oil over medium heat. Once shimmering, add onions, carrots and celery; sweat until onions are softened and translucent (about 10 – 15 minutes), do not let brown. Stir in chicken bones, bay leaf, thyme, parsley, peppercorns and water. 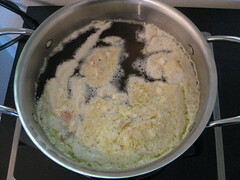 Bring mixture to a strong simmer, remove scummy layer from top (do this periodically throughout the entire cooking time, if necessary [usually once or twice more]). 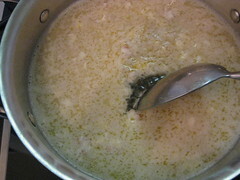 Reduce heat to low and cook at barely a simmer, stirring occasionally, for 4 hours. 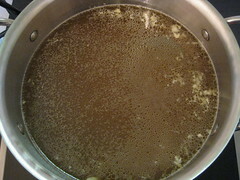 After stock has simmered for 4 hours, strain through a fine mesh sieve (DO NOT PRESS DOWN ON SOLIDS for this or any of the following straining steps). Strain a second time through a Jelly Strainer Bag or cheesecloth-lined (use a double layer) mesh sieve. Stir in 4 teaspoons Kosher salt (more or less to taste). To speed up chilling, transfer stock to two, shallow baking pans (about 9×13 each). Cool to room temperature, then cover and refrigerate until cold (8 hours or overnight). 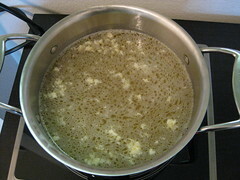 Skim congealed fat layer from the top, and proceed to clarifying steps. For a visual guide of the process, please see photos below. In a small bowl, whisk together egg whites, shells and water. 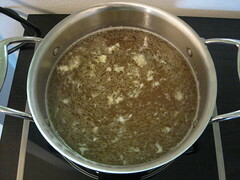 Pour cold, defatted chicken stock into a large stock pot; stir in clarifying ingredients. 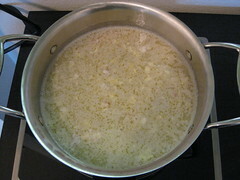 Place pot over medium heat and, stirring occasionally, bring mixture just to a strong simmer. 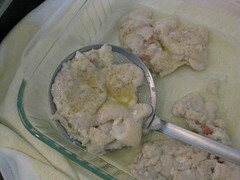 Allow mixture to rest for 10 minutes before removing (and discarding) egg white “raft” from the top. (I use an all metal, mesh skimmer purchased from Ikea years ago. It’s no longer available, but the following is a highly rated one available through Amazon.) 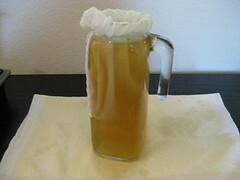 Strain stock through a Jelly Strainer Bag or cheesecloth-lined (use a double layer) mesh sieve. Transfer stock to desired storage containers. (To avoid any off flavors, cool to room temperature beforehand if using plastic containers. I really like these 2 cup ones by Delitainer, they’re very sturdy with a tight-fitting lid.) 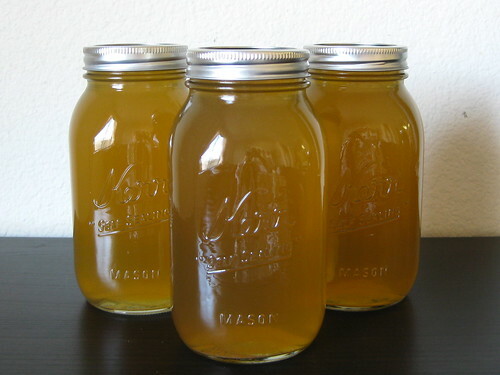 Cool stock to room temperature before refrigerating for up to a week or freezing for 2 – 3 months. ¹ I used 3 pounds of backs, 1 pound of necks (about $1.50 per pound at Whole Foods butcher counter). If you want to use chicken feet, use kitchen shears to remove tips (claws) (about $2 per pound at Whole Foods). Beautiful pictures and great post!! Looks wonderful 🙂 And how sweet of your neighbor! Thank you! She was always so darling — I consider myself very lucky to have grown up with such a thoughtful woman next door. Thank you, thank you, thank you! 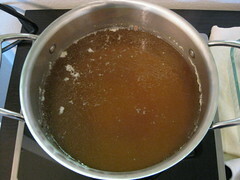 I have never made stock before, used a recipe that left our some important info (like- DO NOT BOIL!!!) and well, you can imagine what stock looks like after you boil it for 2 hours… I followed your instructions and my stock looks great! Hopefully it will taste good too. Hooray — thank you for letting me know that all of my blathering came in handy, I really appreciate it! 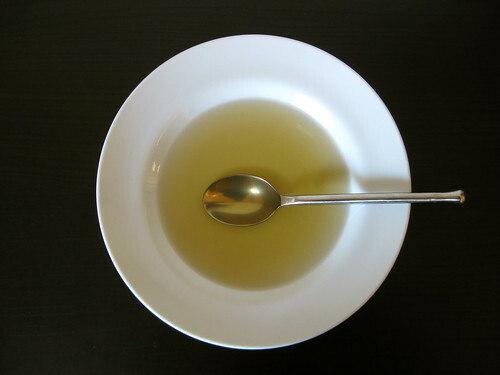 As for the taste, if you find it a little flat after adding the indicated amount of salt, go ahead and add a little more — for whatever reason it really brings out the flavors. Thank you for the photos of the rafting! I usually just multistrain my stock and say “hey, it’s homemade what more do you want!” – but trying this today and wanted something to give me a clue! I am assuming that the amount of raft is contingent on amount of stock (from other reads) and will adjust the amounts I need! I’m so happy to hear that you found the photos useful! That’s my usual strategy/thought process as well, but sometimes the stars align and I feel fancy :). You got it — hope it turned out well for you! I made a pork stock that needed to be clarified. So strained all the solids out, then through a mesh sieve to remove smaller particles. I usually just use egg white and shells but this time I thought the stock needed a lot of clarifying. Just looked that way. Made a raft with grated cabbage (happened to have a bag in the fridge), egg white and shells. Stock was still cloudy-ish after multiple strainings. I usually use a reusable coffee filter as the final strain but it was not cutting it this time. Didn’t want to dirty up my cheesecloth (plan on making some ricotta) so I strained through super clean dish towels in batches, using a fresh towel each time. Voila! Rinsed the towels in super hot water with baking soda then into the washer (had to do a small kitchen towels load anyway). Thanks for this post! I shared it with my daughter and sister! Easier than having me explain! Lol!